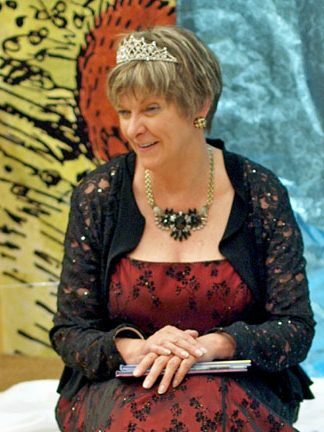 It’s hard to find a kid, a mom and dad or even a grandma and grandpa who don’t know Eric Carle’s The Very Hungry Caterpillar. In fact, 2019 will mark the 50th anniversary of the publication of this beloved picture book, in which a little egg hatches into a tiny (and very hungry!) caterpillar. After eating his way through five days of delicious fruits, our intrepid caterpillar eats so many things on the sixth day—most of them decidedly not healthy—that he develops a stomachache. He is no longer a little caterpillar, either. He is a big, fat caterpillar. And he won’t be that for long…. 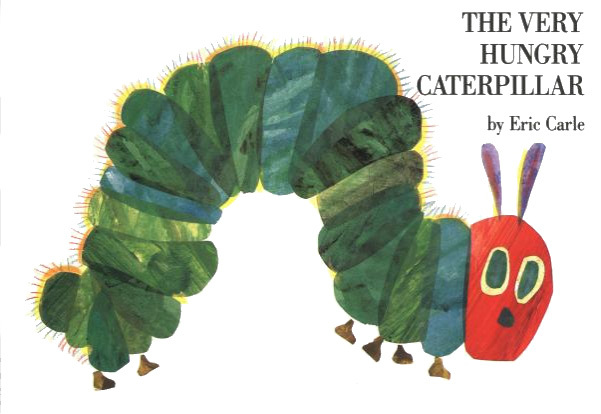 My guess is that The Very Hungry Caterpillar, rendered so beautifully in Carle’s trademark hand-painted paper collage technique, will delight little ones for 50 years to come. Now comes the fun part. Place each fruit in a separate bowl. Blindfold your kids and hand feed them a bite of each fruit, giving them a sip of water between each bite to cleanse their palates. Their challenge is to name each fruit as they eat it based on smell, taste and texture. Not too difficult, probably, as these are fairly common fruits that I hope they’ve tried before! The end result? Your kids get to feel smart, and they get a healthy snack in the process. Sneaky, no? 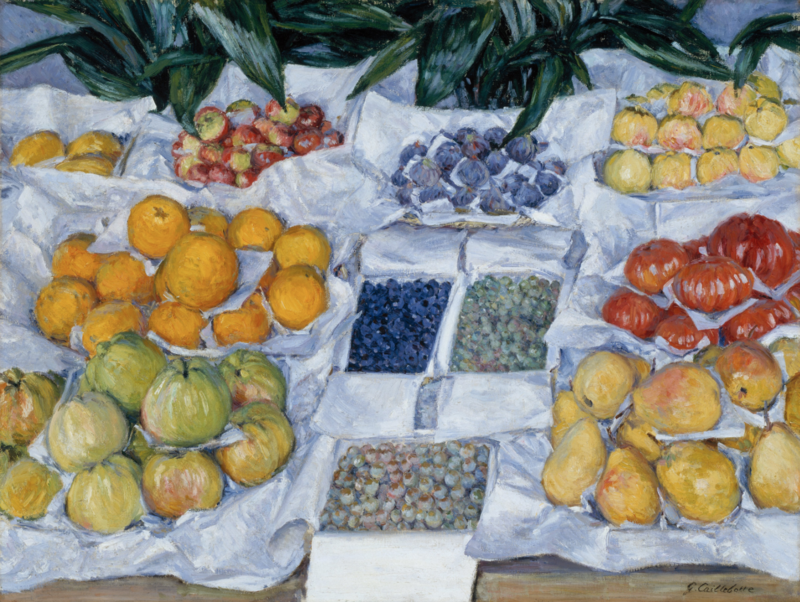 Fruit Displayed on a Stand, Gustave Caillebotte, 1881-82. Once they’ve mastered the hungry caterpillar’s diet, have them try to identify some additional fruits while blindfolded–like the grapes, figs and blueberries in this gorgeous 19th century painting of an open air market, rendered by French Impressionist Gustave Caillebotte. Throw them a curve by tossing tomatoes into the mix, and you can have the whole “Is tomato a fruit or a vegetable?” conversation. (Botanically, it’s a fruit, a fleshy vessel for the seeds of a plant; to chefs–and the Supreme Court!–it’s a vegetable! Read all about it with your kids at the National Geographic site: Is a Tomato a Fruit? It Depends on How You Slice It.) Then send a handful of cherry tomatoes to school with the older kids so they get a chance to explain why they’re eating them for dessert! After all, what kid doesn’t love to be an expert? Photo credit: Google Art Project via Wikimedia. 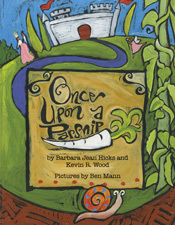 Book cover image: amazon.